While looking for something else in my overstuffed clip files, this old postcard fell out from between two folders, and immediately, I thought about the story it contained. Albert Clifford Barney was heir to a large Cincinnati industrial fortune. 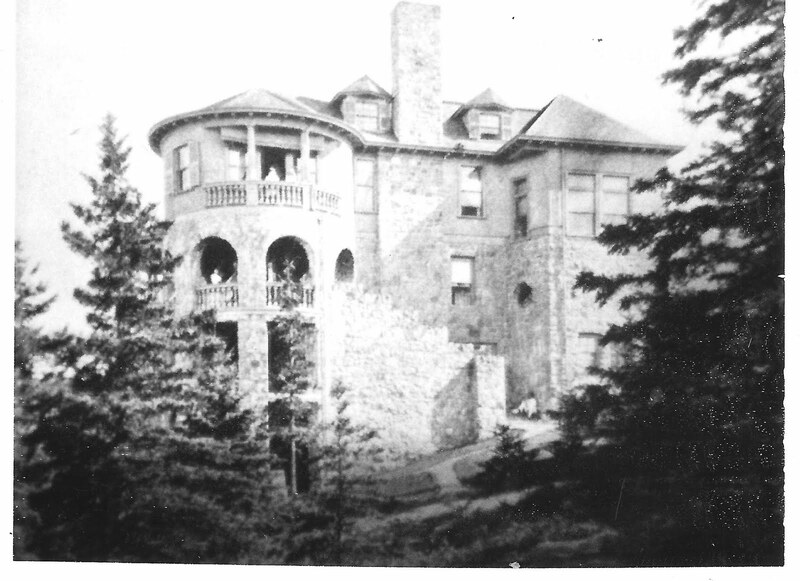 In the late 19th century, he and artistic wife Alice and their daughters Natalie and Laura, arrived in Bar Harbor to occupy Ban-y-Bryn, their newly built cottage on a craggy hill overlooking Eden Street and Frenchman’s Bay. Designed by Sidney Stratton, Ban-y-Bryn was a somewhat unconventional house, considered ‘modern’ for the times, although it was also compared to a medieval castle by one writer. 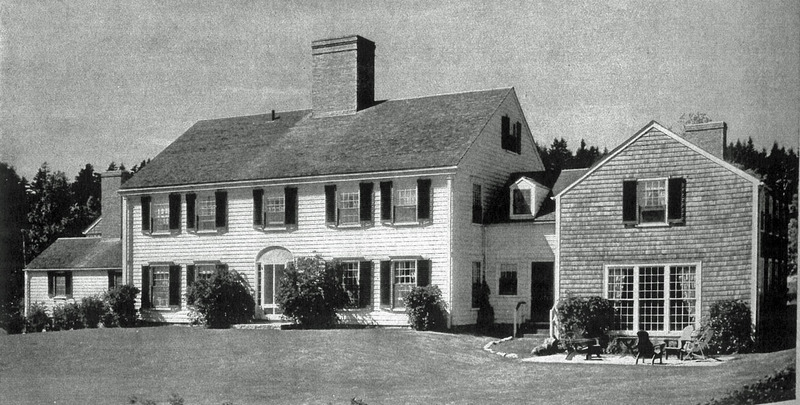 Built on a steep hillside, with mountains on one side, and the ocean below on the other, the house had 27 rooms on four floors—a top floor studio for Mrs. Barney, expensively finished woodwork of exotic woods in the major rooms, and basement kitchen and service areas. 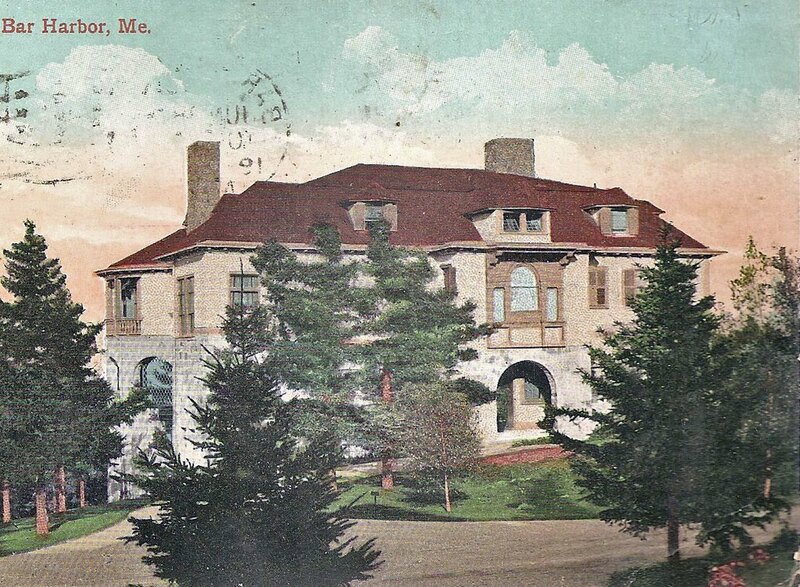 A wealthy and charming couple, the Barneys were an immediate social hit in Bar Harbor, and for the next two decades, the local papers, as well as the New York Times society pages covered the Barney’s summer entertainments. Many of these took the form of short plays and tableaux vivants, often written by the Barney’s elder daughter, Natalie, soon destined for greater fame as Rene de Goncourt’s famed Amazon, and, but for Gertrude Stein, the most famous American Lesbian writer/saloniste in Paris (a surprisingly large demographic in the early 20th century). Unlike Stein, Barney was young and beautiful, and scandal and excitement attached her every move. But, I am ahead of my story. 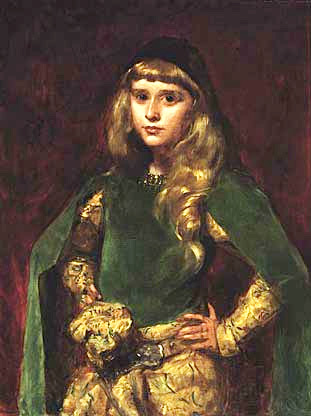 Already artistically inclined, Alice Barney’s ambitions went beyond the usual High Society yearnings. A chance encounter with Oscar Wilde, on his American lecture tour, at a New Jersey beach (no, you did not misread that sentence: Oscar Wilde. New Jersey. Beach.) gave Mrs. Barney the encouragement to devote her life to art. The Barneys moved to Washington, where Mrs. Barney created her famous studio house, as she pursued a career as a painter. Poor Mr. Barney, a more conventional, clubbable sort of chap, was soon left behind, as his wife and daughters each pursued a different Eastern religion, dabbled in exotic pursuits, and enjoyed their lives of Bohemian privilege. Natalie attracted endless attention in Bar Harbor. She scandalously rode horseback western style, not sidesaddle, and drove her carriage at high speeds. One of her tableaux vivants, produced with her family and friends as a fundraiser for the local hospital, featured a play based on the Queen of Hearts from Alice in Wonderland. Next door neighbor Walter Damrosch, conductor of the New York Philharmonic, played the Queen, whilst Natalie, in a glimpse of things to come, played the King. And how did the Barneys arrive each summer in Bar Harbor? They would board the Bar Harbor Express, a crack train of the New York Central, originating in Washington, which communicated between several major cities and the fashionable summer resorts. 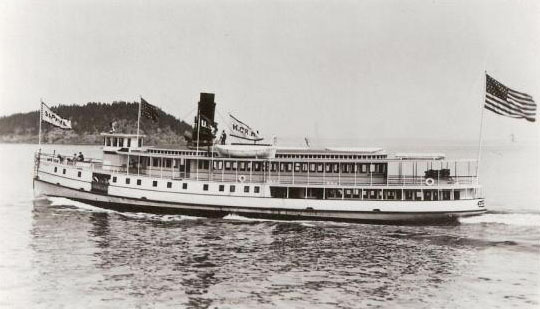 After a pass through Ellsworth Maine, the train made its final stop a little further Down East at Hancock Point, where passengers would disembark and board a steamer that would glide them across the waters of Frenchman’s Bay to Bar Harbor. And the name of this steamer, that each season took the Barney daughters to their summer playground? The Sappho. As for Ban-y-Bryn itself, it burned in the forest fire of 1947, along with seventy other of the large cottages that once populated the hills of Bar Harbor. I can't imagine Oscar Wilde at the Beach…..or New Jersey.Sensitive aesthetes. Thank goodness – they keep us on our toes. 'Unconventionality' and sensitivity to one's surroundings and overall aesthetics go hand in hand. It reminds me of the following account:"According to an account, when Wilde arrived at the apartment, Proust was running late for some reason, and the visitor was shown to the drawing room, where he met Prousts' parents. 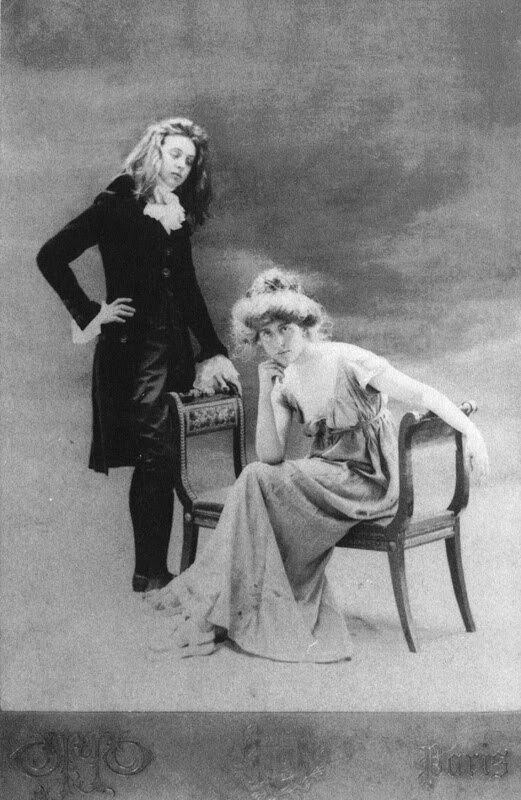 Apparently the solidly bourgeois appearance of Dr. & Mme Proust frightened the bohemian in Wilde, causing his courage to fail him; he hid in the bathroom, which is where Proust found him when he returned home, out of breath. Wilde explained the circumstances to Proust and took his leave. Prousts' mother told him that before retreating to the bathroom, Wilde had looked around the drawing room and commented, 'how ugly your house is. 'Thank you for this post on an interesting subject. I must resort to a cliché and say that this post wasjaw-dropping. Had no idea about Miss Barney's girlhood, or that Walter Damrosch played the Queen to her King. We in the 21st century tend to view the past as a dry and lifeless diorama of stuffed figures until learning what things were really like back in the day.And then that boat called Sappho…. So intriguing! I have never heard of any of these Barney women! Much research follows! Dandy, correction duly noted, thanks. And don't forget the lovely Alice Pike Barney house in D.C. that might as well have burned to the ground as it was callously sold by the Smithsonian. >There's a great biography of Natalie Barney by Suzanne Rodriguez, WILD HEART- A Life Natalie Clifford Barney & The Decadence of Literary Paris. It came out in 2002. Lots in there about her summers in Bar Harbor growing up & "sapphic" goings on, particularly with Eva (Evalina) Palmer.